For the cake: In a big pan, melt the butter and the chocolate. After melting, stir and cool the mixture. Mix eggs and sugar in a big bowl, adding flour at the same time. After mixing them properly, add the butter-chocolate mixture, vanilla and salt into the bowl. Stir them well until they get smooth. Put some oil into the cake mold and pour the mixture. Cook for 25-30 minutes in the oven which is preheated to 190 C. After cooking, leave it outside for 10-15 minutes to get cooler. For the hazelnut paste cover: Leave the butter outside the fridge beforehand, so that it gets softer. Mix the butter, hazelnut paste and vanilla for 2-3 minutes. Adding the powdered sugar slowly, continue mixing them together. Pour the hazelnut mixture on the cake without taking it out from the cake mold. Leave it in the fridge for 30 minutes. For the chocolate ganache: Warm up the cream in a pot. Break the chocolate bar into small pieces and put them into the cream. Stir until they melt and take it off the stove. Leave it to get cooler. Reserve some of it for the edges of the cake; pour the rest on the hazelnut paste cover without taking the cake out of its mold. Put the cake back into the fridge and wait at least for 1 hour. 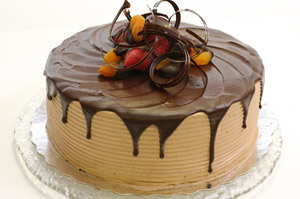 After taking the cake out of its mold, use the rest of the ganache for covering the edges.